just 30 minute drive from Canton on Hwy 19 S.
Three Days Only.... THIS WEEK! You will find all kinds of great bargains. Just a reminder that there is only 1 week left at Our Little Corner for my Christmas in July items. And Yes i will sell and ship anything you see . The Available items are on my Christmas Page and prices are there as well. If you See anything you like, feel free to inquire, but make sure you give me your email so I can contact you back. Also, I got great news last week. My booth at Our Little Corner will be moving to the Yellow Building just across from the check out, starting in September. I'll have more news about the change as it gets closer. I am excited about the move and cannot imagine a better location within the mall. This pic was taken just before Alex's Wisdom Tooth Surgery Yesterday. My friend and I both scheduled our kids at the same time so we could keep each other company in the waiting room, and call each other to see how the other was doing. It worked out great, and both patients are doing well. And this is just after, with the Dr. Thank you everyone for your prayers. Things are looking good. No swelling, only small amount of pain. Only 1 pain pill today, and now on just Advil. He just needs to heal with no complications and we'll be home free. Thanks again. Sorry it has taken me so long to post my finds, but life just got in the way. And I'm not exactly sure what that tubular basket is, but I couldn't pass it up. German enamel utensil holder. It says something close to "cleanliness is next to Godliness" Both purchased at The Salado Antique Mall. Well there you have it, some of it I'm keeping, and some is already at Winnie and Tulula's. Some will be at Our Little Corner and some is still being cleaned. I got another great load today from on of my favorite "Pickers". I'll share that later. Son #2 (Alex) is having his Wisdom Teeth removed tomorrow. If you are a believer, please pray for no complications, during or after, and full quick recovery. Depending on his recovery I may be offline all weekend. Or I may be so board sitting at home waiting for him to need something, that I'll be online all weekend. I hope it's the latter. One of the things I've learned, when shopping in unfamiliar areas, is to ask shop owners where more places are. After shopping at a place in Salado, we asked the owner if he might know of some true junking locations. He directed us to a flea market, and said it was "hit or miss". We'll let's just say it was "miss" this time, But on the way we passed a curious shop. DH said "we'll hit that on our way back" and so we did. I walked in and knew immediately that is was a place you would all want to read about. I went to find the owner and ask if I could take some pictures. Ready to explain all about blogging as I usually do. As I approached and Said "are you the owner?" She turned around and responded with "You're Margo!" Well I was double shocked at being "recognized" and then pleased that I could just ask about pictures without having to explain myself. And then Marta said something that made her my instant new BFF. Marta is a long time lurker and blog reader. She has been written about several times on other blogs, but I must have missed it, because this shop was a sweet surprise to me. Here are some more shots of Marta's place. Be sure to stop by if you are ever driving around in Belton Texas. Directions are at the bottom. And she doesn't just do white and cream and pink There is a Red Room, Blue room and even a black room. All beautifully done. Marta is very friendly and will be happy to chat with you about her love of junk and things old. Be sure to tell her you read about her here, if you stop by. Take G Wilson Exit, go east on service road, 1 block on the right. After shopping in Round Rock, we headed towards my ultimate destination. But first a store I had only heard about. Anthropologie! Now living in a medium sized town has one down side...Shopping. Or the lack of it. So the chance to be in the Big City and have an Anthropologie near by could not be passed up. We found it and went in. I was at first surprised by all the clothes, because what I had usually seen from here were unique home fashions. They were there, but clothing takes up most of the floor space. 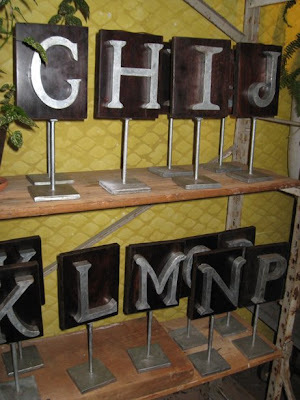 I especially loved the old industrial pieces they use for display. And vintage inspired unique accents. I'm sure these letters on stands were inspired by old signeage. This is a truly unique garden chair. Love these graphic cups all lined up on a vintage industrial shelving unit. After I made my very small purchase (i'll show later) we headed off to Uncommon Object on S Congress. I must say that the short drive from Anthropologie to Uncommon Objects did not disappoint in it's entertainment value. As they say in Austin "Keep Austin Weird"
The inside of this place is as interesting as the outside. It's full of eye candy, around every turn. Definitely not your typical antique mall. Here is a tip for shopping here. It's not a big store. Walk in, take a deep breath and start heading down the isle of your choice. Look at everything eye level. Then go back through and look down, and then lastly go through again and look up at the ceiling. You'll be amazed what you missed the first 2 times through. There is no way to describe this place, it is something that must be experienced. And it has the perfect home in the center of the artist area of Austin on S Congress. Take a short walk up Congress on the same side of the street for the best Tex Mex Lunch. Sorry can't remember the name of the restaurant. But it was Gooooood. Round Rock has only 1 Antique store, according to who I spoke with. And it's a doozie. The highlight of this place is in the center, and the booths of Jan Nordstrom and Susan Pridgeon. I love the way these ladies display their wonderful finds. Mr Robo got in on the fun too. Round Rock is between Austin and Georgetown, and that will be our next stop. Be sure to Visit the Antique Gallery in Round Rock and tell them I sent you. DH wanted a weekend away, and so we've decided to hit the road headed towards the Austin area. No real planned agenda, just kinda going with the flow. I hope to visit places that I visited last year and possibly find some new ones. I also hope to make it to The Carolyn Westbrook Home Summer Market on our way home. I've made some good finds already this week and I can't wait to share them with you. But for now, Gotta Run, the open road awaits. You can read about the Austin, Georgetown shops here, here, and here. I've been dying to share this with you and now is the time. Junkers are getting a new Magazine. Pop over to Ki's blog for all the info. now at Our Little Corner antique mall, Noonday Texas.